This is the time of year when nondescript vines that have gone unnoticed all year explode with brilliant orange and yellow popcorn-like berries. Found along woodland edges and other untamed places, the vines are commonly known as bittersweet. They are prized for the brilliance they bring to the fall landscape and for their value as seasonal decorations, popular for wreaths, garlands, and flower arrangements. 'Autumn Revolution', a cultivar of the native American bittersweet. There are two kinds of bittersweet, one native to the US and one introduced. Not only is the introduced vine extremely invasive, the native is disappearing in the landscape, and is protected in some areas. The native, American bittersweet (Celastrus scandens), is a fast-growing twining vine. It blooms in June, though the flowers are unobtrusive. Both male and female plants are needed for berries. It will grow enthusiastically through the summer, climbing trees, shrubs, or any surface it can twine around. As the berries ripen, the yellow husk reflexes backwards away from the orange fruit, and those quintessential fall colors are revealed. The leaves also turn yellow in fall. Many birds, including grouse, pheasant and quail, and wildlife such as rabbits and squirrels eat the berries. Deer and rabbits will eat the vines, which may actually be desirable if the plants start to overwhelm their surroundings. American bittersweet needs full sun and average soil. Soil pH can range from acid to neutral. Plant in spring. Prune in winter or early spring if vines get unruly. American bittersweet will grow 20 or 30 feet. It's native from Maine to Montana, through the south (except Florida) to Texas and the plains states, as well as most of Canada. American bittersweet is hardy in USDA plant hardiness zones 3 to 8. In a garden, train the vine on a trellis, arbor or fence. The vine can also be used to cover unsightly areas such as brush piles or old stumps. The plant needs little care, as it is drought tolerant once established. Its cousin, Asiatic bittersweet (c. orbiculatus) is an extremely invasive plant in the US. Also known as Oriental bittersweet, it has the same appealing orange and yellow berries. But it can easily grow 60 feet, smother surrounding vegetation, and is very difficult to eradicate, since it spreads both by berries and by its root system. Both American and Asiatic bittersweet look alike, which makes identifying them in the field a difficult task for the layman. The difference is that American bittersweet has a smooth vine, and Asiatic bittersweet has dull thorns. The leaves of Oriental bittersweet are rounded at the tips where those of American bittersweet are more pointed. Both are enthusiastic growers, and can be challenging to eradicate when well established. The berries of both American and Asiatic bittersweet are poisonous to humans. 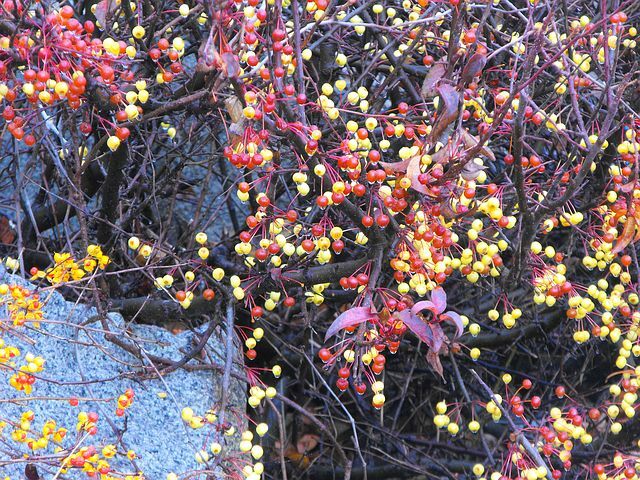 Using Asiatic bittersweet for decorations can inadvertently spread the berries, so if you are not sure which type you have, don't compost or throw it in a brush pile when you are finished using it. Be sure to throw the berries away in the trash. 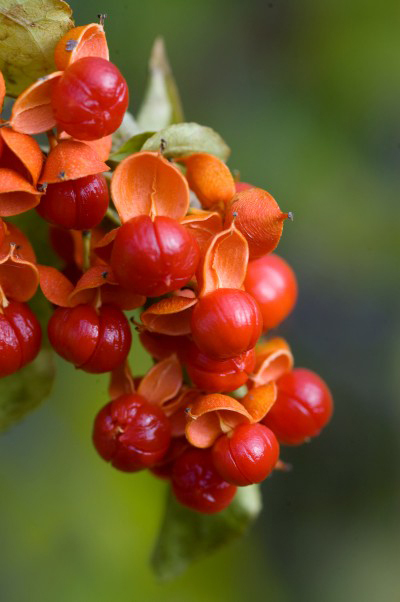 First Editions 'Autumn Revolution', a cultivar bred by Bailey Nurseries, has both male and female parts, so only one vine is necessary to produce berries. Find sources for American bittersweet through these websites: American Beauties Native Plants (abnativeplants.com) and Bailey Nursery (baileynurseries.com).